We have a great selection of activities and games perfect for indoor events or outdoors in a gazebo or marquee. Many of these games require a small footprint, so are perfect when space is limited. 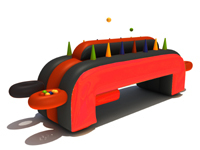 Inflatable Air Hockey is great for indoor or outdoor events. The game is played using air filled tubes to direct the ball into your opponents goal. This inflatable game has an interchangeable pitch which can also be used as Air Football. 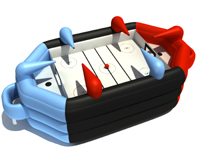 For more information on this activity, visit the Inflatable Air Hockey page. 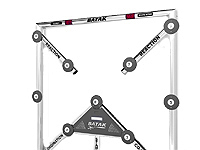 Batak Reaction Wall is a challenging, quick paced game perfect testing your reaction times while having fun. The exciting game consists of twelve LED lights that light up one at a time. The aim of the game is to hit as many of the lights as you can within your allotted time and try not to miss any of the targets. Buzz wire games are fun and full of laughter. 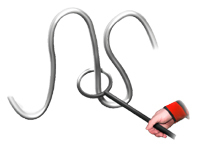 Our giant steady hand game is a traditional game which tests your nerves. Can you get from the start to finish without setting off the Buzz Wire? Choose from a single player, two player, or helmet mounted wand. For more information on this activity, visit the Buzz Wire Hire page. Table football (also known as foosball) is a fun and fast transitional pub game. Our full size portable foosball table looks fantastic and is a great way to keep guests entertained at your event. 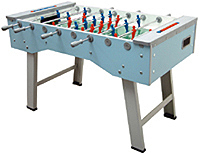 For more information on this activity, visit the Table Football Hire page. Our portable American Pool Table is a fantastic looking 7ft pool table with a green cloth playing surface. The Pool table a professional quality table and will look amazing at your event. Included in the hire are two full size pool cues, triangle and chalk. For more information on this activity, visit the Pool Table Hire page. Giant Scalextric is a perfect activity for all ages. This Scalextric track allows up to six slot cars to race at one time on our multi lane racing circuit which is complete with pit lane. With fully computerised scoreboard and race control, many different game scenarios can be played and player must ensure they take a pit stop before they run out of fuel. Our Portable Table Tennis game is a top of the range table suitable for both indoor and outdoor events. The table tennis table is official ITTF dimensions and comes complete with bats and balls to enjoy this popular pub game. For more information on this activity, visit the Table Tennis Hire page. For more information on this activity, visit the Under Pressure page.